Almost all of us are familiar with China's great man-made attractions. The Forbidden City in Beijing. The Terracotta Warriors of Xi'an where you can start your Silk Road travel. Shanghai's skyscraper forest in Pudong. For a country of its massive size and varied geography, however, it's surprising how relatively few people outside China appreciate the extent of the country's other attractions, many of them natural wonders to rival any in the world. Is it possible to limit a list of China's superlative attractions to a mere 40? Not really. But a photo memory card goes only so far. And, as this gallery illustrates, it's impossible to stop clicking once you get a camera in front of some of China's most beautiful places to visit. The list is in alphabetical order. The 900-year-old village of Hongcun has long drawn in-the-know Chinese visitors, who love its tranquil vibe and distinctive architecture. The striking Huangshan mountain backdrop (see No. 2) doesn't hurt, either. Its classic structures, Moon Lake and picturesque locals have been an inspiration for art students for decades. Walking the narrow lanes paved with quartzite and seeing farmers working in rice fields, with the reflection of ancient houses in the lake, should provide enough material to get you started on your own visual masterpiece. A major landmark in southeast China and a UNESCO World Heritage Site, Mount Wuyi was the setting for the development and spread of neo-Confucianism, influential in East Asia since the 11th century. Bamboo raft drifting in the Nine Bend River (lower gorge) is a popular activity among visitors. The two-hour, eight-kilometer trips provide grand views of Mount Wuyi. It's the best way to take in the serene beauty of the smooth peaks and clear water. Admission: RMB 140 for Mount Wuyi park, RMB 100 for bamboo raft drifting. 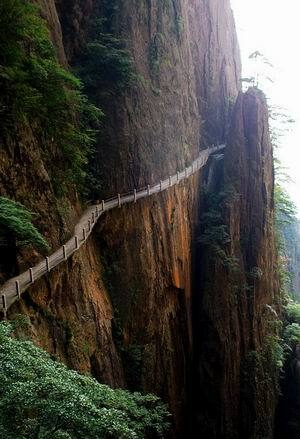 Mount Wuyi is about 350 kilometers northwest of Fuzhou, the provincial capital of Fujian. Major cities connected to Fuzhou Airport by direct flights include Shanghai, Beijing, Guangzhou and Xi'an, these places are always contained in top 10 China tours. Yes, a humble mudflat is a favorite destination of Chinese photographers. Admission: RMB 120 during peak season (May 1-October 31) and RMB 60 in low season. Echoing Sand Mountain and Crescent Lake is six kilometers south of Dunhuang. China Southern operates a daily return flight between Xi'an Xianyang Airport and Dunhuang Airport. Air China flies between Beijing and Dunhuang once a day. Erected mostly in the early 20th century, the fortress towers at Kaiping were built by famously outbound Kaipingers, who brought home the many architectural styles they saw abroad, including Islamic, Roman and even ancient Greek. The towers were built as a display of wealth, and as a practical way of protecting locals from war and theft. Approximately 1,800 fortress towers still stand amid Kaiping’s vast rice fields. Kaiping is located 130 kilometers southwest of Guangzhou, the provincial capital of Guangdong. Regular buses are available between Kaiping Bus Terminal and various long-distance bus terminals in Guangzhou. Direct buses and ferries are available between Kaiping and Hong Kong which is an indispensible destination for your popular China travel package.